If you are looking to learn how to make homemade mozzarella sticks, you’ve come to the right place. Though traditional mozzarella cheese can be used, it is easiest to make with perfectly portioned sticks of string cheese. This piping hot appetizer can be ready to enjoy in just 10 minutes! You know what I absolutely crave when it is hot and muggy outside, and my house feels like a sauna? Deep fried food! Well, not typically, but Tuesday I was absolutely ravenous for some good ol’ deep fried Wisconsin cheese! Cheese is to Wisconsin what corruption is to Illinois… we couldn’t function without it. It’s practically our state vitamin. Heck, Wisconsin’s deep fried cheese curds look like over-sized vitamins, and they sure make me feel a lot better! If you like Mozzarella sticks, you HAVE to check out my Beer Battered Deep Fried Cheese Curds recipe too! 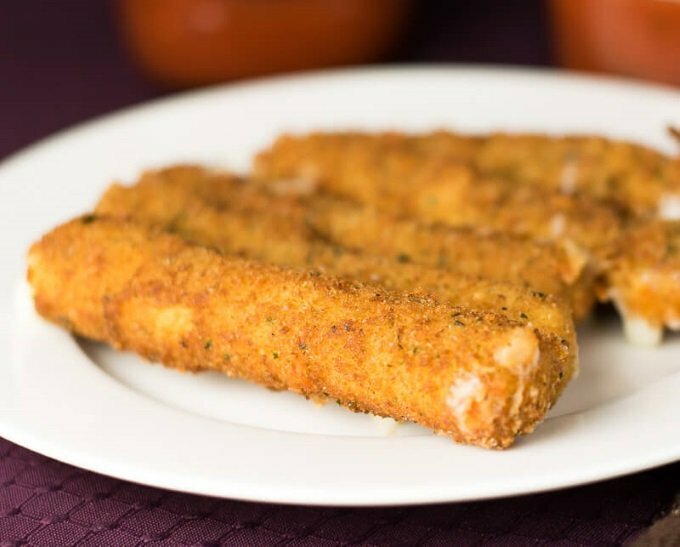 Mozzarella sticks are a popular deep fried appetizer consisting of long slices of mozzarella cheese which are coated in seasoned breadcrumbs and fried until golden brown and melted inside. Mozzarella sticks are most commonly served with marinara sauce for dipping. 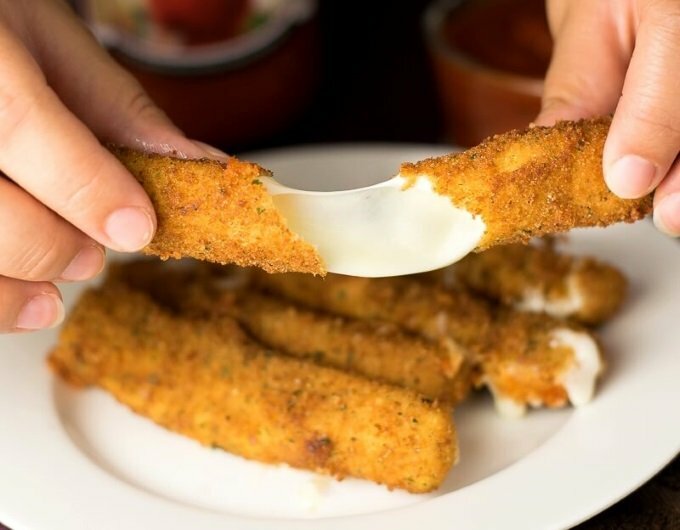 Making homemade mozzarella sticks with string cheese is not a difficult proposition, particularly if you take advantage of the fact that string cheese is already in perfectly portioned sticks ready to fry! All you need to do is bread them and dunk them in oil! You can even make Doritos Mozzarella Sticks if you are feeling crazy! Yes, you can make homemade mozzarella sticks without frying, by baking them in the oven. However, I find baked mozzarella sticks have a higher risk of error since you can’t monitor their cooking as closely. You are more likely to end up with melted white blobs than stretchy homemade cheese sticks! Not to mention, baked mozzarella sticks aren’t all that healthy either. You are still chowing down on big sticks of breaded cheese. Might as well fry them in oil, get better flavor, and have a better chance of them cooking to perfection. If you still wish to attempt baked mozzarella sticks I recommend freezing the cheese prior to breading and baking them in a 450-degree oven until golden brown and the cheese threatens to ooze out. Freezing the cheese buys you a little more time before you have a melted disaster. If you don’t have a deep fryer, and I don’t, I recommend using a cast iron fryer. It has deep walls which is perfect for containing and oil threatening to splatter over, and the heavy nature of cast iron is perfect for maintaining a steady temperature. All of my deep frying is done exclusively in this. The links on this page may be affiliate links. 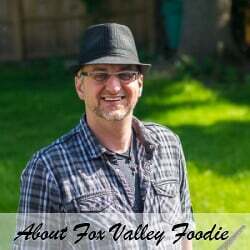 Any purchases made through these links help support FoxValleyFoodie.com without any additional costs to you. Use your digital thermometer to monitor the frying oil temperature. The oil temperature will drop after adding the initial batch of mozzarella sticks, so I typically increase the heat of my burner after I start frying, or raise my initial frying temperature a little over 365 to compensate for the impending drop. It is also a good idea to do a test batch with a single stick to get an idea of how quickly your mozzarella sticks will cook. If you see the cheese oozing out, they are overcooking and should be removed immediately. Mozzarella sticks are a classic bar appetizer, making them well suited to pair with other bar food and game-day fare. When creating your own menu, think of an appetizer sampler you would order at a sports bar. Items such as chicken wings, homemade French fries, and fried green tomatoes would all go together nicely. You could even serve your mozzarella sticks as an appetizer for a nice juicy homemade burger! Making homemade mozzarella sticks with string cheese is easy because the cheese is already perfect portioned! Just bread and deep fry to perfection! IF YOU LIKED THIS RECIPE you will love my Easy Cheese-Stuffed Breadsticks too! If you cooked this up at home and enjoyed it, please let me know in the comments below! It is a nice reminder of why I write these recipes. If you enjoyed reading my homemade mozzarella sticks recipe then you should probably like me on Facebook and follow me on Pinterest too. That’s what I would do at least, because if you don’t get to know me but you still use my recipe it is kind of like taking candy from a stranger, and your mom taught you not to do that. Don’t disobey your mom, subscribe to Fox Valley Foodie today. What a great appetizer idea! I feel like I’ve been in an appetizer rut this summer! This will help change it up! Thanks! This sounds perfect,.. But I wonder if I could bake them to make it a little healthier? These turned out perfect!simple and delicious! Made these tonight as an appetizer to an Italian dinner. Wow, they’re amazing. I cut the string cheese sticks in half before breading them. Didn’t change the recipe at all, but it made it easier to dip without double dipping in some marinara sauce. My family loved this recipe! Will make again for sure! Can you premake these and freeze them for later? Yes, that would work well. Freezing would also help prevent the cheese from overcooking too quickly. Yes, you can freeze them. I suspect they would last quite a while in the freezer if stored properly. Yum these look simply delicious!! Thank you for this! ? I made these the exact way it says and it’s **** terrible. The bread crumbs won’t even stick to the cheese stick even if we manage by some miracle to get it to stay it cooks the crumbs off! And we end up with a melted cheese blob! I’m sorry it didn’t turn out for you. Breading and deep frying can certainly be a challenge for many people. Dipping deep fried food in an egg wash then breadcrumbs is a tried and true practice that has been around forever. I recommend giving it a little practice and you’ll get it. It sounds like your breadcrumbs may have gotten soggy, I’ve found they don’t coat as well if they aren’t dry. Also be sure you are letting the egg wash drip off so globs of it don’t come off in the breadcrumbs. A delectable sensation for my tastebuds! Fantastic idea thank you ever so much for sharing. You sir are a genious. Great Recipe! I used the link in my most recent blog post. Hope you don’t mind! Love Mozzarella sticks, but any other cheese you’d recommend. I love the texture of Mozzarella, but I find the flavor a little boring. Like something strong and punchy! Any of your favorite cheeses will work just fine. Provolone or brick cheese would be two mild alternatives that have a bit more flavor. They also melt nicely. Does it only severe 4 mozzarella sticks or does it severe more? It depends on how much string cheese is in your 16 oz package. If your package has 12 sticks of cheese, it will make 12 mozzarella sticks. I dipped my cheese sticks in egg and then bread crumbs 2x and the crust came out perfect. Love how easy this is! Once you freeze them, are you supposed to fry them again to reheat or bake them? The Illinois joke is in bad taste, just like this recipe. Shame on you. I bet you’re a hoot at parties. Lady, you are crazy. The joke is hilarious and the recipe is spot on! My daughter Jaycie and I made this. It was terrible. IDK what happend. THIS WAS GROSS! Do you know why? Plz answer. Thx. You’ll have to give us more information before we can tell you what you did wrong. Can you please clarify exactly what issues you experienced? There was cheese all over the place after frying! Ok that is an easy one. It just needed to be cooked less. If the oil temperature is too high, or it is left in the oil too long, it will become too melty and fall apart. Basically, like the recipe notes explained, if you over fry it the cheese will be too melted and unruly. My names is Samantha,I just wanted to right to your company and make a suggestion. I was wondering what u would think about doing a deep fried pepperjack cheese stick. I was at home making homemade onion rings, and then I had some pepperjack cheese in my fridge so I grabbed it out of fridge and thought I wonder what this would taste like if I do poured in batter and deep fried it. I did it and it was so good, had that kick to it. So if I were u I’d give it a try. Thanks Samantha, I love pepperjack cheese, I have no doubt that would be fantastic! I would season the batter (eggs & milk) .Maybe some garlic powder, onion powder, italian seasoning etc. I tried trying so far at low to med temp, but they basically melted in the frying pan. I didn’t have any issue with soggy bread crumbs and have experience with egg washing several dishes. I’m now going to try baking at the recommended 350*F and will report back. 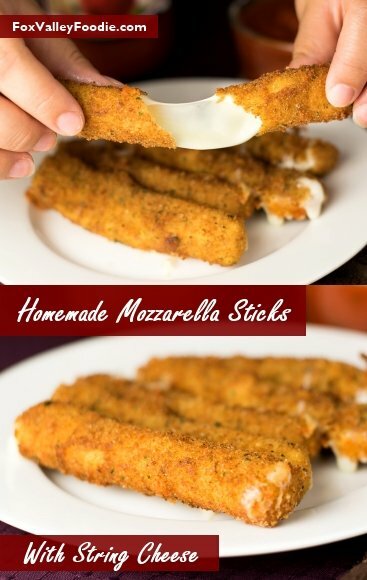 It’ll be nice to have an easy peasy way to make delicious mozzarella sticks. How would these do cooked in an air fryer?? Can you make these with an air fryer. I don’t use an air fryer and have never used one, so I am not sure. I am sure there are probably air fryer recipes for mozzarella sticks if you google them. Simple and delish !!! Family gobbled them up in a hurry! Great recipe! I just tried this recipe as a last minute Superbowl recipe, It was Great! I dredged in flour first and then chilled outside in the snow for an hour before frying. The breading stayed on and they fried to a golden brown quickly. Everyone loved them! Anyone tried in their air fryer yet, thoughts.